On the image below where the downtube connects to the bottom bracket what is the connection there, is it some sort of simplistic lug and the downtube is brazed inside? Not seen a bike frame that looks quite like that before. 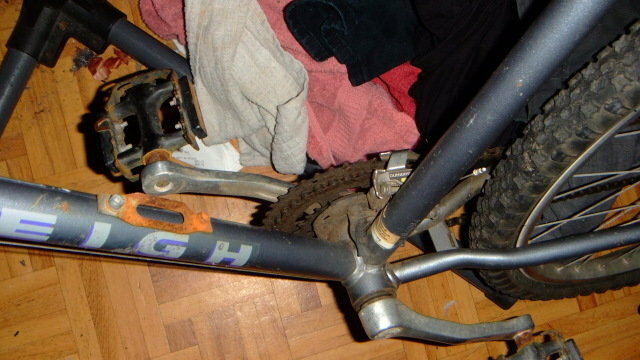 It's an old Raleigh Gritstone from about 1994/5. Just curious about the braze/weld. It's a step up quality bike for Raleigh at the time utilising a Altus drivetrain with 7 speed freehub so neither bottom or top of the range of bikes. The frame is a basic high tensile steel frame with what they call 'energiser' stays presumably because they don't flex and quite thick or even solid. While the bike is definitely assembled in England I'm unsure if the frame was manufactured in the UK or imported. More views from different angles might confirm if the shell has cracked (looks like it IMO) and whether the weld bead got any penetration on/in the seat tube and shell. 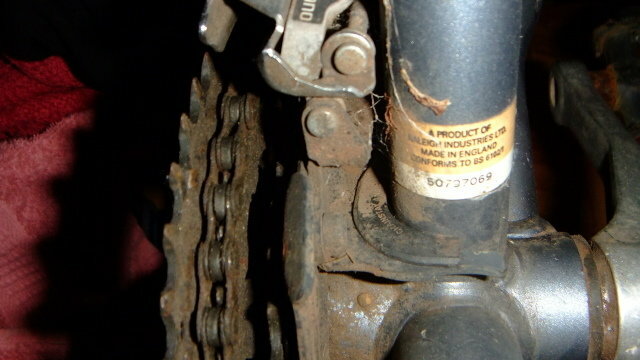 Another image from a different angle that also shows the thickness of the join of the chainstay. I don't think it is broken. It looks like a very odd derailleur hanger sitting on top of the shell, also what looks like an integrated chain catcher. I see some writing on the top of bracket. Perhaps clean off the writing and give more info. I wasn't stating the frame necessarily represented step up quality but the Altus components with a 7 speed freehub was well above bottom end pricing of the time when many of their models featured lower end components and freewheels. It is my intention to convert the bike into a drop bar touring bike with a 1x wide range 11-34t 7 cassette setup. The bike seems exceptionally strong and of course a bit heavy. I am not fully up on all forms of welding in manufacturing, but I think the technique used on that frame involved just getting everything very hot and smashing the parts together. That's why the weld beads are so large, they are really part of the tube. I'm sure it's quite strong and that frame is probably very heavy.